A penny for your thoughts? Photo by J. Lewter. If this beauty could talk, she would have a southern accent. I found her outside of my apartment while I was watering my roses this week. 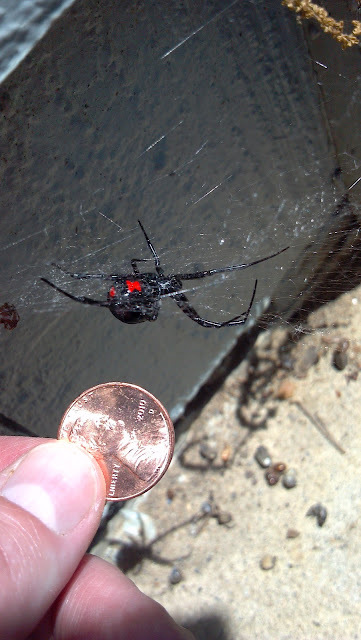 The distinctive red hourglass shape on her abdomen is characteristic of the Southern Black Widow (Latrodectus mactans.) People usually freak out and kill these spiders as soon as they see them, but there is really no need. They are not aggressive and would prefer to scramble away from you if given the opportunity. I once spoke to a medical doctor in northwest Arkansas who said he only treated 2 black widow bites in his entire 25 years of practice. One lady had been carrying firewood and a black widow crawled into the crook of her arm. It bit her when she flexed her arm. The lady, as well as the other bite victim from an unrelated black widow encounter, were both in the hospital on a morphine drip for about a week. Black widow bites, although rare, can be quite painful.